Small- and medium-sized businesses should consider automation of processes to lower costs and facilitate easier expansion. Here are more reasons to automate. I t is true what they say that what you are willing to risk reflects the values you believe in. When a startup business begins to grow, an entrepreneur can either take the cautious route or be more of a risk-taker. If you value growth, then you must be willing to take the needed risks. Whatever style you choose, there has to be planning involved. One of the areas that make entrepreneurs nervous when it comes to planning and investing is upgrading the technology they use to manage everyday processes like payroll, sales, and accounting. They presume that automating will be too expensive or difficult to use. Robert Cheng, President and Chief Executive Officer of Alliance Software, gives his advice below on how small and medium businesses can use the Alliance Edge Business suite to cut costs and ease the growing pains of an expanding startup. How does your business make money? If you are a retail startup then your revenues will come from sales. This is where you can immediately upgrade the technology you use by switching to a point-of-sale (POS) system. Robert says this system is a revenue generating activity covering not only the cost aspect but the revenue part as well. 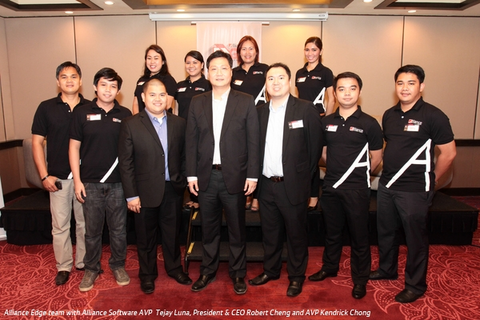 “The Alliance WebPOS is the only Web-based POS system in the market right now. It is unique because not only can it access your information anytime and anywhere from the Web but there is an offline mode,” he says. Even when there is no Internet access, a retailer can still use the software and transact. Moreover, if you want to open a retail outlet in a mall, part of the requirements will include setting up a POS system so that mall developers can monitor sales. The POS software also has a mobile version that can run on a tablet device. It solves the dilemma of trying to fit in a POS machine at a food stall by saving on space and giving you the option of being able to bring the unit home and avoid theft. The perks of automation are many: saves on labor costs; improves efficiency; and makes expansion easier to control. Gone are the days when an entrepreneur would stop at just opening one branch. “Today I think there is more pressure for businesses to do multiple chains…since malls are opening rapidly all over provincial areas,” Robert says. He recommends automating the payroll system to avoid fraud. There have been cases when manually managed payroll systems lost money for the owners either because of ‘ghost’ employees or government mandated contributions that were not being paid. One can centralize the process by using the Alliance HRIS Payroll software to save time and even allow you to integrate with various government agencies. Entrepreneurs are often intimidated by technology because they presume prices will be out of reach. Alliance Software offers pay-as-you-go schemes that let you subscribe to a service by paying a monthly fee. This is the best way for a startup to try out a new system without committing to it for the long-term while budgets are still limited. “At least if they have this option, it makes things more affordable,” Robert says. In addition, choosing a software company like Alliance Software assures that you have reliable after-sales support and maintenance. Surely, you can entrust your business needs to a freelance developer and save money in the short-term; but you are not assured of consistent service after the product is delivered. That is a risk not worth taking. For more details and to contact Alliance Edge Software, click here .